Wait, The Hulk Is Going To Turn Grey In Avengers 2? It’s been three years since moviegoers last saw Hulk on the big screen (excluding Mark Ruffalo's Bruce Banner cameo in Iron Man 3), but he finally returns this year in May’s Avengers: Age of Ultron. From what we’ve seen so far in the previews, he looks better than ever thanks to improved motion-capture technology - but that may not be his only visual change in store for him. 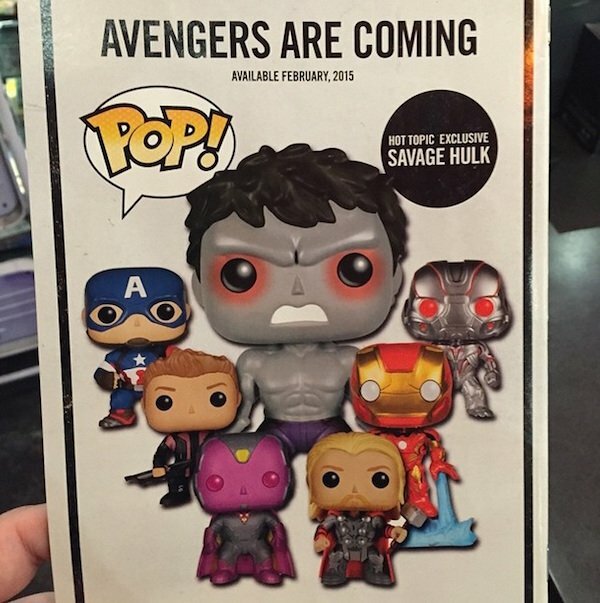 This image, posted on PopVinyls.com, features the grey Hulk alongside his fellow Avengers and Ultron (Vision looks especially adorable). Typically with toys connected to a release, they don’t necessarily match what ends up happening in the film. However, given that the other vinyl figures shown are all in the film and wearing their respective costumes, it does beg the question whether we’ll see Hulk change from green to gray at some point during the story. There are two possibilities that come to mind. It’s been speculated that Scarlet Witch will cast a spell on Earth’s Mightiest Heroes that will trap them in their own, unique hallucinations (like Captain America and Black Widow experiencing flashbacks). Perhaps Hulk’s hallucination will put him in a strange scenario where he’ll turn grey, and judging by the figure being called "Savage Hulk," the grey version is more out of control than his normal self…and that’s saying a lot! There’s also the chance that Hulk will actually undergo a physical transformation into the grey monster. At a closer look, you can see that this Hulk has the same red eyes as the green one had in the most recent trailer. That can’t be good for anybody. While Hulk’s skin pigmentation drastically changing may sound weird, there’s actually a great deal of precedent for it, at least in the comics. In fact, when The Hulk was introduced in 1962, he was originally colored grey, but after the first issue he was changed to green due to ink issues. 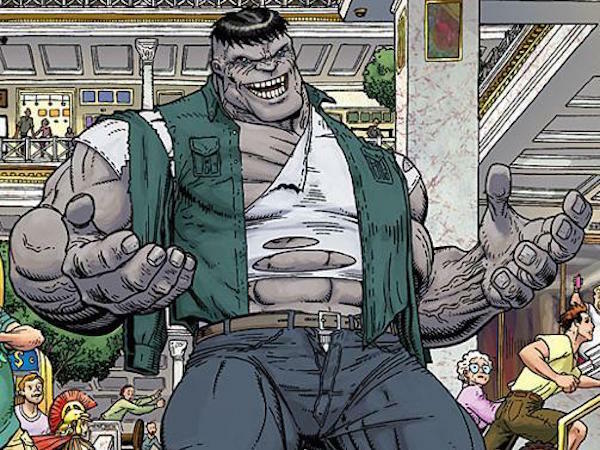 It was later revealed that Hulk’s original color was in fact grey, and that the Grey Hulk was a separate personality from Bruce Banner and the normal Hulk. Although not as strong as his green counterpart, the Grey Hulk was more intelligent, but also more manipulative and shrewd. This persona took the name Joe Fixit and became a Las Vegas enforcer. Picture the normal Hulk, but with a snarky attitude and usually wearing a nice suit. It’s quite a scene. Whether he does turn grey or will remain his natural shade of green, you can see The Hulk in live-action when Avengers: Age of Ultron hits theaters on May 1st.